Have I got something special for you today! 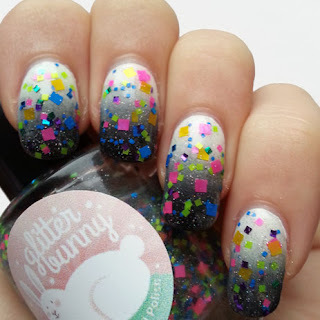 I'm very excited to share these lovely GlitterBunny polishes with you, they are absolutely stunning polishes and.... glittah!!! Can't beat that! 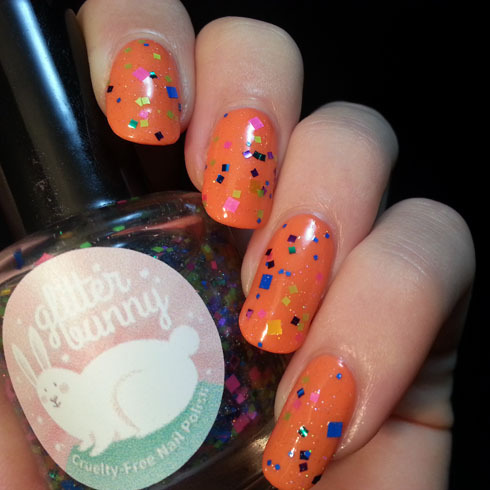 GlitterBunny Polish is an indie brand from Israel. Nicole, the maker of these beauties, is SUCH a sweetie! I swear you won't be disappointed when you purchase from her. I love that the polishes are 5-free and they are cruelty free. Plus, she ships to everywhere around the world for only $4,50! The polishes are simply amazing, and if my promise to you isn't enough, I'll show you just how perfect they are. I've split up my review into two parts due to how many pictures I have of these. I couldn't pick, they're all gorgeous. I received I Got A Goodie Bag, Little Pink Dress, Don't Be Such A Guppy and Part Of That World. I'll show you I Got A Goodie Bag and Little Pink Dress first! The photos with the white background are taken in daylight near a window, the black background is in my studio. The bottles are the usual round 15ml/0,5fl.oz size with the nice flat brush that I love so much. The name is on a label on the bottom (don't turn it upside down with the cap off!). There's something that surprised me, and that is that the polish smells... well... actually pretty good. It's not scented, it's a very obvious nail polish smell, but it doesn't smell as harsh as certain main stream brands. I've noticed some other indies have this smell too, and it's the smell of home to me. Okay, gushy mode *off* and let's hop to it! I'm SO excited to show you this polish! I Got A Goodie Bag is absolutely gorgeous and she just screams my name! 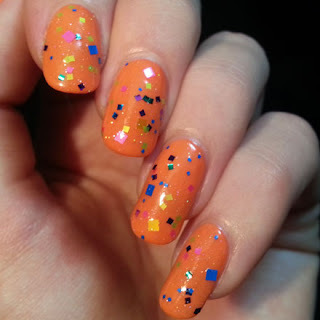 Throw in some square neon glitter in different sizes and colors, and add tiny holographic glitters, PERFECT! Ah-maaaazing. There's yellow, blue, pink and green matte neon glitters and also blue, purple and aqua metallic glitter. I applied a pretty thick layer here so it took some time to dry. A thin coat didn't give me enough glitter for my taste, so I slapped a nice layer on it and called it Joe. No I didn't. I have to tell you a secret... I've wanted a neon glitter topper for a while now, and I Got A Goodie Bag was one of the contenders. She has a great home with me, with lots of love and attention! More prettiness on a black background, taken in my light box that I pretentiously call my 'studio' because I want to be fancy. Also, that's the word we use for it in Dutch, so I have a good excuse. I took a macro shot of the bottle for you, you can see all the glittah floating around in here. There's large square matte glitter in blue, pink and yellow. There's also matte neon glitter in a smaller size and they come in green, yellow and pink, and an even smaller size in blue (you can see those best on top of the large pink glitter). The really cool twist that I like the most about this polish is the metallic glitter. There's purple, blue and dark green metallic square glitter that lights up nicely when it catches the light. And then there's the tiny holographic glitter that makes this polish so perfect! Can you see it floating around everywhere? I didn't like my layering over orange, but that may just be because I'm not a big fan of orange. I saw something really cool last week that I just had to try with I Got A Goodie Bag! I made a black&white gradient to layer it over, tell me what you think! Isn't it pretty? The holographic glitter comes out so great over black! ...and then I had to do another one, because one layer of awesomeness just wasn't enough! It's a bit of a chaos on my nails with two layers, but I still really like it. It made it easier to distribute the glitter more evenly over the nail. That is the one thing that's kind of a challenge with this polish, how to get the glitter everywhere equally. But there's NO fishing in the bottle, all the glitters come out to play of their own free will. Next up is Little Pink Dress. This is a hot pink, going on reddish polish with flakies that flash golden yellow. I only needed two coats to get it opaque and it's so nice. It matches my winter coat! This fushia hot pink reddish I-don't-even-know-how-to-describe-it color describes everything I loved when I was a young girl. If it was up to me, everything in my life would have been this pink. And I do mean everything! My shoes, my glasses, my bag, my coat and my nails. Even my stuffed animals. No, I'm not crazy enough to dye my white (grey by now) stuffed seal pink! Have you ever had a dream about this color? I'm sure I have! Here's a macro bottle shot of Little Pink Dress to really highlight the flakies. They give me a kind of warm fire association because of the color combo. They're also very 'bling', don't you think? Direct light makes the flakies hide though, so make sure to take good care of them! The formula is great by the way, but the flakies give it a little bit of texture which means applying it will ask a bit more of your attention and skill. Yay! That's the first of the four gorgeous GlitterBunny Polish beauties I have to share with you! 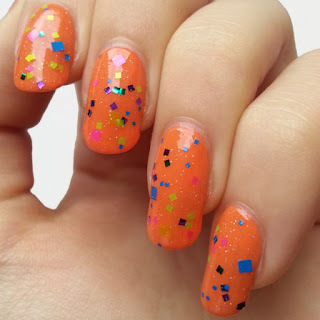 Visit the GlitterBunny Polish Big Cartel store to find and purchase these polishes and so many more. Full sized bottles of 15ml/0,5fl.oz. are $10 each, except for Rainbows On Crack which is holographic and is sold for $11,50. 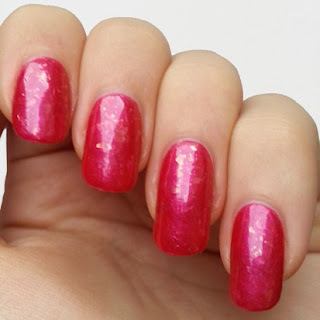 You can also find GlitterBunny Polish on Facebook to keep up with special promotions and beautiful swatches!